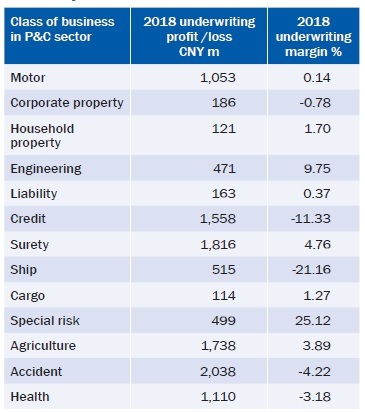 Property insurance companies in China have reported underwriting losses of CNY1.36bn ($202m) in 2018, with the underwriting margin being -0.13%, following underwriting profits posted for the previous eight years. The 2018 financial performance has brought home to the non-life sector that it has to rely on investment income to stay profitable. The results also highlight the deterioration in the operating environment for insurers, which includes tougher competition, rising costs and higher taxes. One reason for the results is that motor insurance showed underwriting profits of CNY1.05bn in 2018, a plunge of CNY6.34bn or 85.8% from 2017, according to an analysis by the financial news platform Quanshangcn. The net pre-tax profit of the P&C sector is estimated at CNY47.3bn for 2018, a fall of 26% from 2017. The sector’s 2018 income tax expense is estimated at CNY22.3bn, an increase of 17% over 2017. After-tax net profit is expected to be CNY25.1bn, a year-on-year decrease of 44%. The increase in tax expenses is because, facing competitive pressures, several insurers incurred commissions and handling fees in excess of limits allowed by the authorities. The excess is not deductible for tax purposes.